Hey! I'm so happy to be back after what seems like forever. Two trips in a row really wore me out! 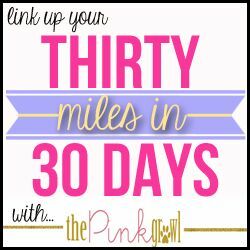 So yesterday marked the end of The Pink Growl's 30 Miles In 30 Days challenge. I met the 30 mile goal last week, but I kept on going. Here's a little recap of my month. BTW, can you believe it's May?! I loved participating in this challenge. It made me even more aware of how much I move (or don't move) throughout the day and how there is always an opportunity to step it up. After eating like junk on my vacations, my body is dying for me get back to its healthy routine. I'm looking forward to May's 30 Miles In 30 Days challenge.